Packing less stuff is only part of what you need to travel carry-on only. It’s also important to have the best carry-on luggage. Your carry-on luggage has to fit within the airline’s restrictions and work well for you. Make sure you know the carry-on restrictions and carry-on allowances for the airline you’re flying. Also make sure the luggage you choose is comfortable and fits with your travel style. Here’s our roundup of the best carry-on luggage plus what to look for to choose the one that’s right for you. 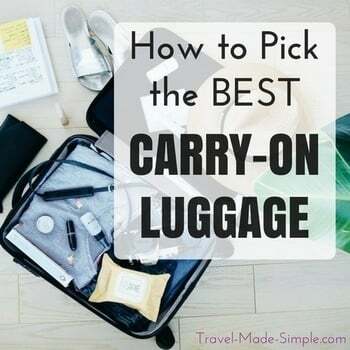 But there are so many options for carry-on sized luggage, how do you choose? It can vary a lot based on your travel style, what kinds of destinations you’ll be traveling to, and your physical condition and comfort preferences. 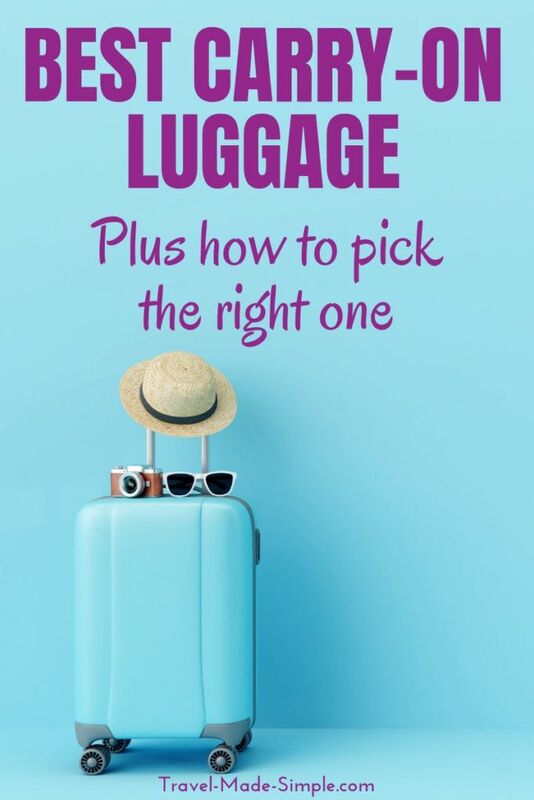 There are many factors to consider when searching for the best cabin luggage: quality of the materials, how heavy is the cabin bag, hardside carry on luggage vs softside, 4 wheel carry on vs 2 wheels, and even how the luggage looks. Do you have a favorite airline? The most popular carry-on luggage size is 22 inches x 14 inches x 9 inches (that’s roughly 55cm x 35.5cm x 23cm), but this can vary by airline or airplane type. There is no standard carry-on size. Review the airlines you fly most often, and pick a size that works best with all of them. Check out the Travel Made Simple carry-on size chart with restrictions for over 170 airlines. Do you have any physical limitations? If you have back problems, you’re probably better off getting a good carry on suitcase. Rolling carry on luggage is easier on your back because you won’t have the full weight of your bag on your body. Where are you traveling? If you’re traveling in more remote areas that might not have paved roads, you’ll probably be happier traveling with a carry on backpack. You’ll have more control over your luggage, and you won’t have to worry about it getting stuck in dirt roads or cobbles. Here’s a look at the major types of carry-on luggage available and their advantages and disadvantages. Lots of outdoor companies make backpacks in a variety of sizes which work great for travel. 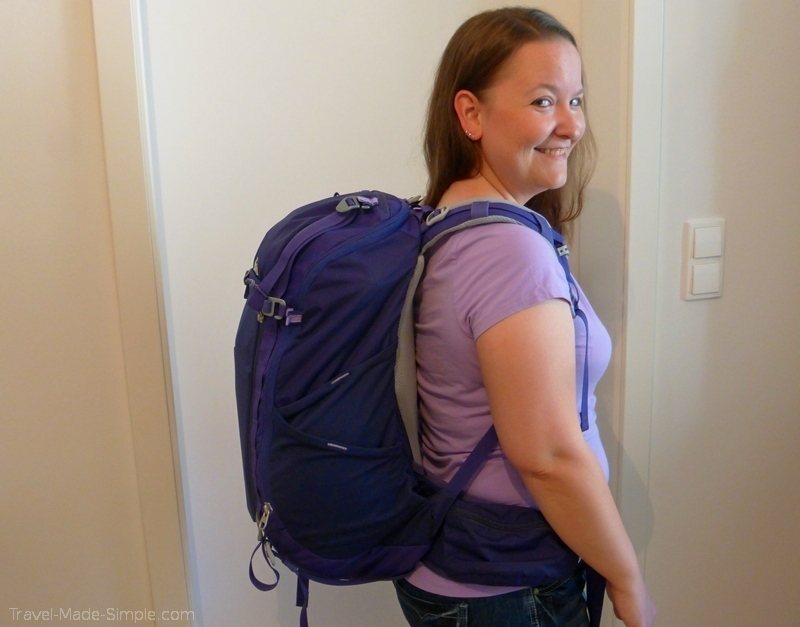 Traveling with a backpack is convenient because it allows you to still have both hands free. I find it easier to move around with a backpack on instead of pulling a wheeled suitcase behind me. One of the major disadvantages of a backpack is that you’re carrying all the weight on your back. Even when you’re packing carry-on only and staying within the airline’s weight limit, having that weight on your back can get uncomfortable and feel heavier than it actually is over time. If you have back problems, this might not be the right choice for you. When shopping for a backpack, look for one with comfortable straps and a supportive waist strap, and a rain cover is usually a great option to have. Compare top loading bags with panel loading bags, and check out all the pockets. Look for the measurements of the bag on the tag so you can check that it fits the standard carry-on luggage size of the airlines you normally fly. Backpack sizes are almost always listed in liters, even in the US, which will help you estimate how much stuff you can fit in it. A good size to aim for is a 40L carry-on backpack. I love my REI Trail 40, pictured below. It also comes in a men’s version. And my husband has an Osprey Farpoint 40L that he loves. Some companies also make bags that are shaped like a suitcase but have backpack straps. The rectangular shape gives you more space to work with, but not as much support as you would get with a traditional backpack. This type of bag is good if you are not going to be walking around a lot or changing locations often. Otherwise you’ll start feeling that weight on your back even faster than with the normal backpack, especially if it doesn’t have a good waist strap. I tried this one from eBags and loved how much I could fit in it, but I wouldn’t use it on a trip where I expect to wear the backpack for long periods of time. >>Also, check out reviews of the Arcido Akra 35L backpack and Arcido Vaga 20L backpack. This is the backpack I use, and I really love it. I like that it has lots of pockets, and it’s comfortable to carry. Comes in male and female versions. 40 liters is enough for us to pack for pretty much any trip. Even without a laptop compartment, I can get mine to fit fine. This is the backpack my husband Andy uses. He likes that it has a separate laptop compartment, and the fit of the bag is comfortable. It doesn’t have a rain cover, but we put an rain cover from a old different bag in the bottom pocket. Again 40L is enough space to pack for any of our trips. I used to have a bigger version of this bag and really liked it. It has lots of good pockets, and this version is small enough to be carry-on for many airlines. There isn’t a men’s version, but Kelty does make 32L and 44L unisex options. Hydration sleeve can be used as a laptop sleeve. Probably the most traditional type of luggage, the wheeled suitcase is something we’re all familiar with. Rolling carry on luggage works well because the rectangular shape means you get the most out of every cubic inch allowed. It’s also easier to keep your things organized and find what you’re looking for while you’re traveling instead of digging through a backpack. While wheeled carry on suitcases are popular for a reason, they come with their own disadvantages. One hand will always be occupied with the suitcase, making it tedious to carry things like food at an airport. Having a wheeled luggage is also more difficult to carry up stairs and along cobbled streets, both of which you will encounter often in Europe. It will probably be easier for you to find the proper size when shopping since the airline restrictions are given in height x width x depth, which is more in line with the shape of the suitcase. Keep in mind that most airlines include the wheels and handle when measuring the size of the suitcase. Make sure you’re comfortable with the handle and that it doesn’t stick out too much when it’s stowed away. Check the wheels to be sure they don’t seem to cheap or flimsy. Last thing you need is a carry on roller bag with a missing wheel. This bag fits within the most common size and is on the lighter end of weight for a rolling suitcase. It only has two wheels, so is more of a tilting roller than a spinner style. This bag integrates a garment bag into a carry on bag shape, which might be interesting if you commonly travel with suits. Again a tilt roller with only two wheels. The spinner style wheels means very little weight is on your arm when you are rolling through the airport. Hard shell carry on luggage can protect your belongings a little better than a soft sided suitcase. If having a hardside carry on luggage is important to you, make sure you look for lightweight suitcases and pick the lightest carry-on luggage possible. You don’t want a suitcase that takes up too much of your carry on weight allowance. This hard shell suitcase also has spinner wheels. It’s made of extra thick ABS material and comes in black. This is quite light for a hard sided spinner suitcase and comes in a variety of colors. Zippered dividers help organize your packing. This hardsided suitcase is made of lightweight polycarbonate material and is on the lighter end of the rolling suitcases. It comes in a variety of colors and has the ability to expand if you need it. This hard shell suitcase has spinner wheels and up to two inches of expansion. It has an easy to access front compartment with a laptop sleeve, and it comes in several different colors. Laptop compartment with locking zippers. Carry on suitcases used to come with just 2 wheels, but now you’ll find lots of 4 wheel carry on luggage. Spinner luggage allow for more mobility since the 4 wheels will spin and turn in any direction. Since the luggage is supported on all four wheels, there is no weight on your arm as you are walking. They come in both soft and hard shell options. This expandable spinner suitcase has several different inner and outer pockets for organization. Comes in multiple color options. This spinner suitcase is hardsided and made of lightweight ABS material. It comes in a wide variety of colors. This spinner suitcase is soft sided and has several inner and outer pockets for organization. The fabric has water and stain resistant coating. This spinner suitcase is hardsided and comes in several colors. It’s made with lightweight ABS material. With so many black and dark blue suitcases out there, you might want to consider a different color to make your carry on bag stand out. Add a little personality to your luggage! Choose pink luggage or purple luggage or even a cute design. Some of these come in different animal prints, like zebra stripes or leopard or cute little owls or cats. Others have colored patterns or camo. There’s even Star Wars themed luggage. This suitcase comes in a variety of colors and patterns. Choose from pink, purple, or multi-colored designs. Or pick hearts, crocodile prints, owls, or floral designs. If bright colors aren’t enough and you want patterns, this suitcase comes in several different varieties of leopard or zebra pattern, as well as a chevron pattern and camo. This suitcase comes in several different patterns. You can choose between owls, turtles, flowers, a beach theme, and an animal print theme. This Star Wars luggage is available with your favorite characters. Choose from R2D2, BB8, Storm Trooper, Darth Vader, or Kylo Ren. American Tourister also sells C3po and Chewbacca versions in different listings. Usually structured like rolling carry on luggage, these come with backpack straps that can be hidden away when you’re not wearing it. This gives you the option to roll it around like a suitcase when you don’t want to have all that weight on your back, but you can also wear it as a backpack when you’re walking on cobbled streets. Having a wheeled carry on that also functions as a backpack comes at a price. It won’t fit you as comfortably as a traditional carry on backpack because it needs to be more structured. You’ll have a harder, flatter surface against your back, so it will feel uncomfortable much quicker. The bag itself will be heavier as well since it has wheels and a more sturdy frame. You’ll also end up with slightly less packing room since the wheels and handle have to be placed into the bag more than they do with traditional rolling carry on luggage. Some of the carry-on backpacks with wheels also come with a zip-off day pack. It will still have the same advantages and disadvantages, but with the added bonus of a smaller backpack. You can wear the whole thing as a backpack, roll the whole thing as a suitcase, or separate the two. You probably won’t be able to fit the whole thing in the overhead compartment, but you can keep things you want with you during the flight in the day pack at your feet. If you decide this is the type of carry-on luggage you want, try on the bag as a backpack to see how it fits. Make sure you can’t feel the handle or wheels digging into your back. Check how it functions as a wheeled bag to make sure you’re comfortable with that as well. And if it has a zip-off day pack, check how the day pack fits and how easily it zips on and off of the suitcase. Detachable daypack has a laptop sleeve and several pockets, but you will need to separate it to get the main bag to be carry on compliant. 18 x 11 x 7 – Detachable daypack. This is primarily a spinner bag as it is no hip belt or detachable paypack. It does have straps you can deploy and wear it like a backpack if you need to carry it on your back. Backpack straps and duffle bag straps. No hip belt and no detachable backpack, but the wheels are covered when in backpack configuration if you are worried about your clothing. No hip belt means this convertible is probably not for long treks, but being able to carry the detachable daypack on the handle as well as zipped to the front, gives it more versatility. An important thing to keep in mind when choosing carry-on luggage is that airlines include the wheels when measuring suitcases. Before you buy, make sure the description of the suitcase indicates if the measurements include the wheels. Often they’ll list one measurement for the body of the suitcase and another to include the wheels. This means sometimes it’s advertised as 22 inch carry-on luggage but if the wheels are not included in that measurement, it’ll be too big for an airline that allows 22 x 14 x 9 inch bags. Another factor to consider is the weight of the suitcase or backpack when it’s empty. Many airlines have weight restrictions, so choosing lightweight cabin luggage is important. The heavier your carry-on suitcase is, the less weight allowance you’ll have leftover for your belongings. Choose the lightest carry-on luggage that fits your needs. If you’re looking for the best luggage for international travel, your needs probably aren’t much different from domestic travel. For international carry-on luggage, you need to check the acceptable sizes for the airlines you’ll be flying. There is no standard international carry-on size, and each airline comes up with their own size and weight restrictions. Check our chart with carry-on luggage sizes for more than 170 airlines worldwide. Do you often travel for work? To find the best carry on luggage for business travel, look for well-made carry on luggage with a laptop compartment. It should be easy to take out your laptop at security checks but secure enough to protect the laptop if your suitcase gets knocked around a bit while in transit. Once you’ve picked the best carry-on luggage for you, there are other items I always travel with that help me pack better. Stuff bags are great to use a daypack. They fold or roll up into themselves and take up almost no space, making it easy to pack one in your carry-on luggage. Aside from using mine as a daypack or a beach bag, on longer trips I’ve also used it for groceries and as a laundry bag. We own several of these bags in two different colors. They pack small into their pouch, but also lay flat if you just want to stuff them into your suitcase last minute. This is the bag that Andy uses when we travel. It is super light and packs small, but big enough for a shirt, kindle, waterbottle, and map without even being overloaded. Very lightweight and packs super small. As a stuff-able pack, it won’t have the structure of a normal backpack, but great for taking food on a daytrip or on a long busride. One big compartment is what you get with these kind of stuff packs. It does pack super small and has wide straps to distribute the weight of what you put into it. Since I’m traveling with only carry-on luggage, it helps to use packing cubes to stay organized. Packing cubes also compress your clothing (some brands more than others) which means you can fit more in your carry-on bag. Other sizes and combo packs available. The slim cubes are what we have and use. I can fit 5-6 tightly rolled shirts into the middle size slim one. Other sizes and combo packs available : 3L half cube and 7.5L full cube compression zippers. I use the half cube again for 5-6 tightly rolled shirts. Liquids can be a pain when flying carry-on only. But with a little extra effort, they won’t stop you from traveling with only cabin luggage. Do some test runs ahead of time so you know how long your toiletries last. You might be surprised at how far your shampoo can go. Use refillable bottles for shampoo, conditioner, and other important liquid toiletries. I also like replacing liquid toiletries with solids whenever possible. Solid shampoo, solid sunscreen, and solid bug repellent have made my life a lot easier, and I definitely recommend giving them a try. Also available in 2 oz and 3 oz capacities. Silicon. Solid shampoo can be a great way to reduce the amount of liquids you pack, making it even easier to travel carry-on only. These take some getting used to so you know how much lather you need to fully wash your hair, but then it’s a great way to reduce your liquids. Bonus: Less plastic waste! This solid sunscreen works just as well as the liquid kind you’re used to. You have to be a little more careful to make sure you’ve covered everything since it goes on clear instead of white, but I have found the protection to be very effective. I’m one of those people mosquitoes find from miles away, and this solid bug repellent works just as well as the traditional liquid spray kind. Even better, you don’t have to worry about accidentally inhaling it. Aside from the benefits of eliminating another liquid item from my packing, I like this solid version better than the liquid version. There’s a lot to consider when picking the best carry-on luggage. Think about the kind of traveling you want to do and what your preferences and comfort levels are. You have to decide which type of bag works best for you when traveling carry-on only. But finding the best carry-on bag will make your travels much easier and much more enjoyable. Traveling carry-on only might seem restrictive and difficult to do, but I believe NOT checking luggage provides me with more freedom. Whether you’re trying to avoid checked bag fees, you’re worried about the airlines losing your luggage, or you just want to travel lighter, packing carry-on only is something you can easily do too. I’m a wheel bag kind of carry-on girl. I like the wheel bag because I don’t have to carry it around, which can be rough on your back and shoulders. That’s probably the number 1 reason in favor of wheeled bags. I do like them sometimes, but I’m a backpack girl. Really, it is very important to carry yourself while traveling. It is good to be a light bag packer but you cannot drop necessary things. I always hear people complaining about 2 things: I forgot my bla bla thing & Oh, I can not lift this heavy bag. So always plan your trip and pack your bag according to that. It is Selection of right bag is very important. Thanks Ali for writing this type of post. Thanks Peter! You definitely need to make sure you can carry what you pack. Having a bag that’s too heavy hinders you in too many ways, and you just don’t need that much stuff. I’m a horrible over-packer and have never been able to pull off just a carry on, unless it’s a weekend trip. Am going to try it for our next journey up north. Great gear tips! Thanks Andrea! I think the key is not letting yourself bring too many “just in case” items, be willing to wear the same thing more than once, and being things you can mix and match. No crazy turquoise shoes that only go with one outfit or anything like that. Yes! Packing carry-on only is SO LIBERATING! Seeing people struggling with their luggage while you just breezily stroll through the airport or crowded touristy area is an amazing feeling. I had a 26L/carry-on size backpack for a 2 week trip this past fall, and while it took a lot of time to pare down what to pack, it was so worth it when we were walking several kilometres a day in tropical heat! As long as you are ready to do some sink laundry, you can get by happily with surprisingly little..
My Tip: At the end of your trip, make a packing list for a similar (climate, activities, etc.) future trip.. It’s harder to remember what you needed/didn’t need/wish you had packed months later. Wow, I can’t believe you traveled with a 26L bag! Even if I left my laptop at home, I’m not sure I could pack *that* light! I’m very impressed. I like your idea about making a packing list after your trip. It’s always good to look back at your trip and decide what worked and what didn’t, and especially what things you didn’t even use. Thanks! Wow, that’s quite ambitious! As much as I love traveling light, I don’t think I could ever go with just my passport and toothbrush! But yes, you can get almost anything you need when you arrive. And it’s so much more relaxing knowing you’re not carrying a lot and realizing that you can find what you need when you get where you’re going. Very interesting post on carry on bags, just wondering if you will do a follow up posts on how to clean them. It gives me stress, especially when traveling and its dirty. I think cleaning your bag varies so greatly on what your bag is made of and what you’re trying to clean off of it. Probably best to read the labels/tags that come on the bag. Sounds like a great bag Chris! It’s amazing how little you need to travel. So awesome you found something that works well for you! Yes wheeled bags are nice, but you can injure yourself with them just as easily as you can with an overloaded backpack. The angle your shoulder rotates to for pulling the weight behind you puts strain on your rotator cuff. Those type of injuries require surgery to repair and never fully heal. Just because you have a wheeled bag doesn’t mean you can ignore the weight of your bag. Sounds pretty extreme, I hope that kind of thing doesn’t happen often! But all the more reason to pack light, overly heavy bags can be problem in many ways. Thanks Kirsten! Back in 2000, we traveled to Italy on a tour. We didn’t have to move our own luggage outside of the airport. We were novices to traveling around on a tour. Between 2 of us we had 5 pieces of luggage, 2 very large bags, 2 carrying, 1 medium bag. It was obscene! I noticed in our travel group 2 couples who each had a wheeled carryon & a personal item. They were middle aged professionals. They were the first on & off the bus and airplanes, since we moved about Italy as a group. My niece & I noticed they basically wore the same clothes for 10 days, changing it up with different shirts & tops & colorful scarfs. After being totally exhausted with collecting our bags, & don’t forget having to go thru the bags to find what you want, I realized no one cared what we wore every day. Now I travel with a carryon only. Pack enough underwear, but plan on re-using clothes more than a couple of times. You can always hand wash something if there’s a problem. Unless it’s a cruise or your a model (lol), pack your most loveable items & travel worthy clothes. Focus on the travel experience & the trip itself. You’ll enjoy every minute of your trip! ???? Exactly!! You don’t need so much stuff! No one cares what you’re wearing. I always wear the same shirt a few days in a row. If the trip is longer than a week or so, I will usually find a laundromat or something similar depending on where I am. If I’m in a pinch I’ll wash a few things in the sink. Even for a cruise, you can make it work. Like you said, the experience is important, not your wardrobe. There’s no reason to carry around so much stuff, and you don’t need a dozen options for each day. I have a 45 liter hand-carry backpack with more cubes of clothes for longer trips. This works great since my wife ALWAYS packs the 25 spinner & for medical reasons can’t lift over 20 lbs. Sounds great, I’m glad you’ve found a system that works for you! What brand of cubes and where do you get them? Thanks. Hi Leslie! I have some packing cubes from eBags and some from Eagle Creek. If you scroll back up to the section with the packing cubes and other accessories, I have links to Amazon for them. There are tons of options on there, depending on what sizes you’re interested in and what kinds of things you’re planning on packing in them. I prefer smaller cubes for things like socks and underwear and medium to large ones for shirts or other larger articles of clothing. I also have a small cube I use for non-liquid toiletries. Just wondering for carry on bag for size 21 inch calculate include wheels or excluding wheels? Hi Pooja! The airlines will calculate the size including the wheels, but luggage companies will sometimes say a suitcase is a 21 inch bag when really it’s a little bigger because they’re not counting the wheels. Always make sure you’re looking at the full dimensions including wheels when choosing carry-on luggage. This site has been very helpful. I am trying to pack light for two trips. 1 my daughter is going to Europe for a 4 week study abroad class. Then my sister and I are going to meet her and travel for 2 weeks. Our goal is to do carry on only. The change of planes in Europe is a concern for my daughters luggage. Sounds great, Robin! Your daughter’s luggage should get tagged to go to her final destination, so she shouldn’t have to do anything with it during her layover. The US requires you to claim and recheck luggage at the first US airport you land in, but most other countries in the world do not. 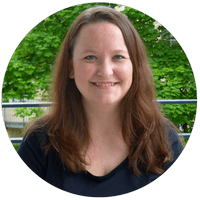 I have several posts about layovers, like this one and this one, that might help you too. I hope your daughter has a great time, I loved my study abroad experience! Can a wheeled duffle bag be used for carry on especially if it meets the measurement requirements? Hi Denise! Yes, as long as it fits within the carry-on size restrictions of the airline you’re flying, that is fine. You can look for your airline here. Thanks Veronique! You can totally travel to Italy for two weeks with carry-on only! You might need to do laundry, but laundromats are easy to find. Just remember all that stuff you packed and didn’t use. I have a ton of posts to help you learn how to pack less. 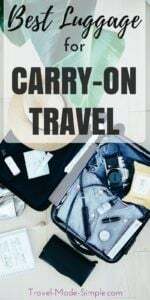 Check out these to get you started: How to Travel Carry-On Only, Carry On Toiletries: Non-Liquid Options for Carry On Travel, What NOT to Pack in Your Carry On Bag, and you can find all my packing posts here.